This coming week, Lanka will make her biannual trek up the Calvary to the Swiss mountains carrying the cross on her back with a litany of war crimes, allegedly committed by her forces during the last years of the 30-year Eelam War, firmly nailed to it. When she finally reaches the Swiss slopes, she will face crucifixion by the western powers unless she can show she has atoned and paid the necessary penance. If she has fallen short in wearing the coarse cloth of the penitent but can show to the satisfaction of these Pontius Pilates that she has at least attempted to atone her sins in some measure, she will be granted a stay of execution; and these Christian nations, showing Christian mercy, will grant her a further time period to confess her transgressions and cleanse her sins she is supposed to have committed. At the March 2015, Calvary climb, Lanka would certainly have been crucified, had there not been a change of regime that January. And the nation would have faced a fate far worse than Iran, with all her oil riches, faced during the embargoes placed upon her. Since these alleged crimes had taken place under the previous regime, the advent of a new more seemingly enlightened Government committed to the tenets of democracy was welcome in Geneva at 30/1 session of the United Nation Human Rights Council and, though the principle held that the sins of a previous government visits the succeeding one, the new outfit was treated with leniency and granted time to set right the UN call for justice to the victims. The 2015 resolution called, among other matters, for a credible investigation into alleged war crimes. The Sri Lankan government promised to do so; and, on the basis of that undertaking made to the United Nation’s HRC, Lanka was granted a temporary reprieve of crucifixion. 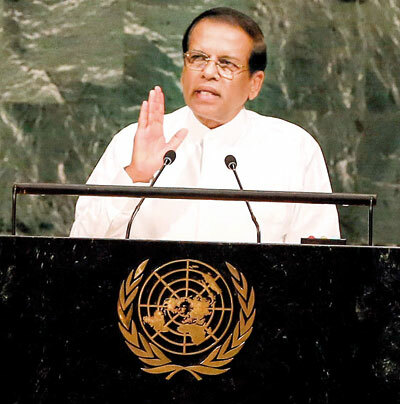 Come 2017, the Sirisena headed government, had failed to keep most of the promises it had made to the UN body, but, with powerful America acting as a co-sponsor, again with Lanka, succeeded preventing the nail being driven into Lanka’s coffin. Lanka was granted a further extension of two years to perform. The international demand was to have a credible investigation to probe the alleged war crimes, set up hybrid courts with local and foreign judges to adjudicate and also to set up an office to inquire into missing persons. 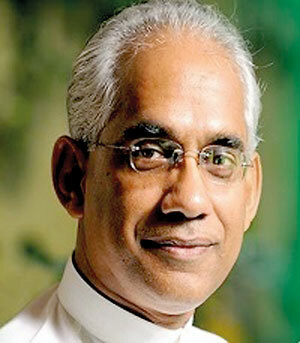 That two-year period of grace runs out this March 21, when Lanka will be called upon to face the music, unless she has a face-saving excuse to persuade why the crucifixion should not be carried out. With the US pulling out of the United Nations Human Rights Council in June last year, calling it a “cesspool of political bias” with the US envoy to the UN Nikki Haley saying it was a “hypocritical” body that “makes a mockery of human rights”, the Lankan lass was left in the lurch, abandoned on the street without a powerful sugar daddy with muscle to champion her innocence though it did come with a price. She didn’t have to wait long to find another. Along came Britain — the nation’s old colonial masters who, more than anyone else, following as they did their tried and tested policy of divide and rule which they practised in every country they set their imperial foot upon, first threw the seeds of division between the Sinhalese and the Tamils and left behind upon their exist from the land, the embers of hate simmering, which in 1983 erupted in flames — this time not alone, as she did in 1802 when she colonised the low land, but with a western werewolf pack to pick up the baton the Americans had dumped in the gutter, to continue the crusade. n AND ALSO NOTES, other steps taken by the Government of Sri Lanka to implement Human Rights Council resolution 30/1, including progress towards establishing an Office on Reparations and the submission to cabinet of a concept paper on a Bill to establish a Truth and Reconciliation Commission, the proposed repeal of the Prevention of Terrorism Act 1978 and the preparation of a draft Counter Terrorism Act, while reiterating in this context the need for further significant progress and encouraging in this regard the adoption of a time-bound implementation strategy. nRequests the Office of the High Commissioner to continue to assess progress on the implementation of its recommendations and other relevant processes related to reconciliation, accountability and human rights in Sri Lanka, and to present a written update to the Human Rights Council at its forty-third session, and a comprehensive report, followed by a discussion on the implementation of Council resolution 30/1, at its forty-sixth session. And what are the demands contained in the 30/1 resolution of 2015 which the new sponsors too keep harping upon and insisting it be done to their satisfaction before the cross is dismantled and Lanka set free? Namely a credible investigation into alleged war crimes, accountability, a hybrid court with a foreign element involved in monitoring the process. It showed that the western nation’s were still out to get their pound of flesh and, despite the change of guards, both at home and abroad, there would be no let up even if Lanka were to bleed more than the actions taken by her to end the terrorist war and restore peace merited. Serious stuff. On the cross. Awaiting to be nailed. That is Lanka’s present fate. Condemned not on the judgment of a Daniel but by those drenched with the blood of those they slaughtered throughout the centuries in pursuit of their colonial ambitions, now come to deliver verdict on this island race for a stain on its sleeve, part of which is its own blood. Not only those who came before the ecclesiastical courts of yore seeking equitable justice were expected to come with clean hands but the same principle held true for those who charged others with bloodied hands. But the world has changed and might has replaced right. Their institutions, their courts, their members: their car, their petrol; so who’s to question the destination they seek to arrive at? No wonder it had the officials at the Foreign Ministry burning the midnight oil trying to compile report after report on how this Government had done its best to satisfy the demands of the international community — as best it could have; how, despite the political odds, it had striven to achieve at least some of the tasks demanded. Well, it’s a tactic — this direct approach — that may well work, though it has never been tried before by any other country charged with violating human rights to tell the United Nations where to get off the bus and to just live and let live and just let bygone be bygones. But when news spread of the presidential solution to the crisis, it had the Foreign Ministry officials’ pants in a twist. All the justifications they had mustered to present before the UNHRC this coming week in Geneva at the 40/1 session to gain a two year reprieve and ward off Lanka’s Day of Judgment seemed all in vain. A simple farmer with his mud washed away and now the presidential king — a Mahadanamuttha with grassroots wisdom no less — had come up with the obvious simple but ingenious solution to the problem which had for so long eluded some of the best brains at the highest rungs of the civil service : ‘Just tell the UN to forget the whole darned thing”. Pure genius. The only problem was whether the human rights diehards at the UNHRC would venture to buy it. And lower their bayonets pointed at the nation before the Lankan president’s appeal to them to condemn to the dustbin the damning dossier of war crimes allegedly committed by Government forces, forget it all and carry on as if nothing had ever happened. Thus instructed, the UNP controlled Foreign Ministry struck back to assure the international community that Sri Lanka will continue to demonstrate its commitment and determination towards a steady and long-lasting reconciliation process through a co-sponsored resolution, and will seek an extension of the timeline of the Resolution 30/1 of 01 October 2015, through a co-sponsored roll-over resolution at the ongoing 40th session of the UNHRC. “In the last few years, the GoSL has taken concrete steps such as the establishment of a Missing Persons’ Office and an Office for Reparations to establish long lasting peace and reconciliation in Sri Lanka in addition to the establishment of Independent Commissions, enhanced by the enactment of a number of enabling laws, including for the Right to Information. This led to the people of Sri Lanka benefiting from economic dividends, including in particular, the European Union’s Generalized Scheme/System of Preferences Plus concessions. A few more laws will be introduced to strengthen the ongoing processes. The entire mechanism and process of reconciliation is under the control of GoSL. He would have been, as they say in jocular legal parlance, laughed out of court. Meanwhile last Friday, the President Sirisena speaking at the launch of the Sinhala translation of “The Viceroy Special”, authored by Defence Secretary Hemasiri Fernando, said that he told those responsible for the construction of the Colombo-Kandy Expressway to continue with their work without flattening mountains and ruining the environment, but they had continued building this road ignoring his instructions and it is clear that there is no one in this government who accepts what he says. “Everybody knows that I am the minister in charge of the subject of environment and before the construction of the Colombo-Kandy Expressway began, I told the big man in Colombo and the big man in Kandy not to level the mountains. But it seems that they are not listening to me,” he moped. If the big man in Colombo and the big man in Kandy are not listening to him when he is the executive president of this country, what on earth gives him the idea that the United Nations will listen to him and follow his bidding when he requests them to forget the past, let bygones be bygones? But he is also reported to have said that “This move will empower women to enter the national workforce. In the present context, women’s contribution to the economy is minimal. That is to be corrected. Isn’t the honest to goodness ex-banker and econonist Eran unaware of the immense contribution women make to the economy and how they help his finanace minister to narrow the deficit in his annual budget? n That thousands of women working abroad, leaving behind their families, to sweat it out in Arabian dunes at the risk of being raped, abused, beheaded and returning coffined home, contribute approximately eight billion dollars and is the highest export earner beating both tea and garments? n That its an all women force that plucks the nation’s tea leaves, one of Lanka’s traditional top export earners? n That over 95 percent of rubber tappers are women? n That more than 75 percent of teachers are women? n That over 95 per cent of nurses are women? n That both in the private and public sector, there is an increasing presence of women in employment? n That in the garment sector, another top export earner, nearly 100 percent of who sew are women? In view of this, isn’t it a travesty to say that women’s contribution to the economy is minimal and belittle the workload they stoically bear without making a song and dance of it? On the contrary, it’s the Lankan male that adopts the same posture of the lion that sleeps in the jungle leaving his mate to do the hunting and bring to his den the venson. That leaves souls deadened stranded beyond hope. And, in those death throes of convulsion and contraction.